The last two days have seen Plymouth Sound operating the Cremyll Ferry, due to a steering problem on Tamar Belle. Journies at high tide have had to be diverted into the Royal William Yard because of space restrictions at Admirals Hard. Plymouth Sound being nearly twice the width of the Northern meant landing at high tide was impossible. Though it is quite a pleasure to have such a lovely vessel. There was a short disruption on the 4:15 ferry this afternoon after the Tamar Belle became unserviceable. As Northern is in for refit and Plymouth Sound was on cruises, the Silver Crest was drafted in from the Royal William Yard to operate the service for the rest of the evening. 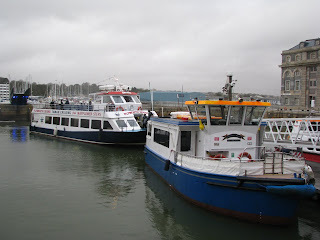 Passengers had to go over to the dock at the Royal William yard to board as at high tide the Silver Crest, being wider, could not get in to dock at Admiral's Hard. We sahll have to wait and see if Tamar Belle is up and running for tomorrow. Western Greyhound has won the Independent operator of the year award for the 4th year out of 5, fighting off close competition from rivals Konnectbus who they run very close to every year. The judges were very impressed with the standard of the fleet upgrades to the low floor Optare Solos and its high quality rural services that they have reliably operated for many years. They even managed to make higher profits than previous years even in these bad economic times. 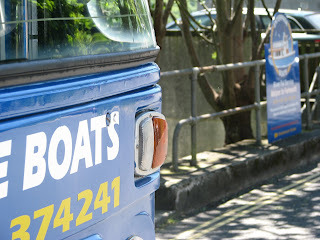 More good news is that Brighton and Hove have won bus operator of the year. Of course B&H are owned by the Go-Ahead group, which have been announced the preferred bidders for Plymouth Citybus. SO even more success could be heading our way! 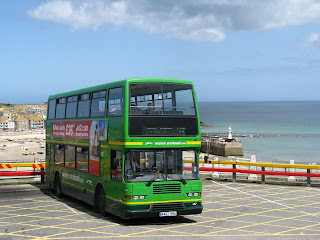 Western Greyhound recently took over the Bude to Callington section of FDC's 76 from Plymouth. But now WGL has taken full control of the route, and I must say its a very impressive start. I was presuming to see a usual Vario on the service, though in fact it was being operated by one of the brand new '59' registered Optare Solos. Apologies for the bad photography, I was playing about with the camera too much, and the torrential rain wasn't helping! Shutter speeds can be such a nightmare in the rain! 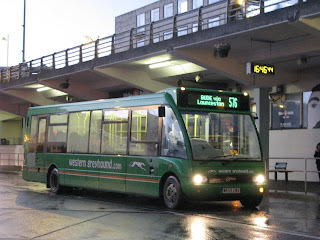 Western Greyhound have also introduced serveral new routes down in Cornwall and are making a big impact on the county's bus travel. Great to see! ... but this time not with FDC! Series 2 Bristol VR YRC 125M, of Enterprise Boats down in Malpas/Truro has made her final trip on the short route between the two locations. She has now passed into preservation, and the service will soon pass either to another bus, or possibly to Western Greyhound for next year's service. YRC was new to Trent Motor Traction Company in 1974, making her 35 years old this year. Remarkably in all these years she has only had these two owners. Such a shame though that quite a symbol of Truro and Cornwall itself has now disapeared. 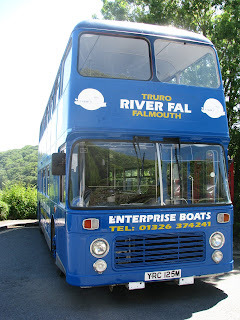 YRC 125M has worked in Truro since 1991. 18 years of fantastic service. 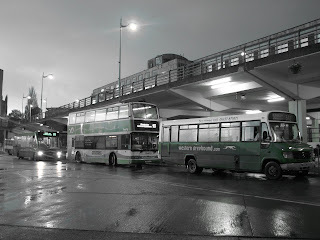 Many modern buses won't last that long in total, let alone on one route. She has now passed into the hands of Richard Waterhouse and Ian Thurma, both commited Trent enthusiasts who have grand plans for her restoration, which has already began. She has even already made her first appearance on the rally circle, in the same month as being withdrawn! Just shows how well she has been looked after and is a credit to the company that has looked after her so well. Though this does mark an end for public service VRs in Cornwall. The last remaining VR in the county is Roslyn's AJH 854T though sadly she is only seen on schools, though does see many visits to local bus rallies. I very much look forward to the final result of the bus, though whether she'll make a journey back down here, I don't know, however much we hope! This week has seen the main road into Millbrook closed for works on the electrics. This has meant that buses serving Millbrook have had to be diverted through other road complexes around Millbrook to miss out this section. 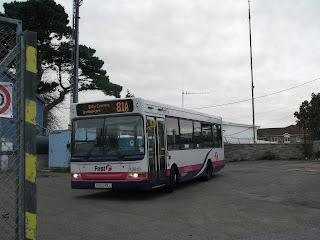 A-Line Travel have been using newly acquired P931 DFJ on service 80s, so that the service can be diverted via Newport Street (round the back!) 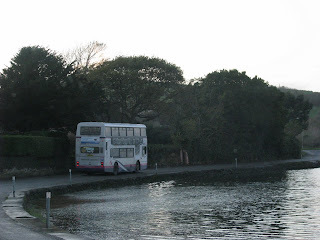 on the services to Cawsand and via the slip road by the Spar on the way to Cremyll. 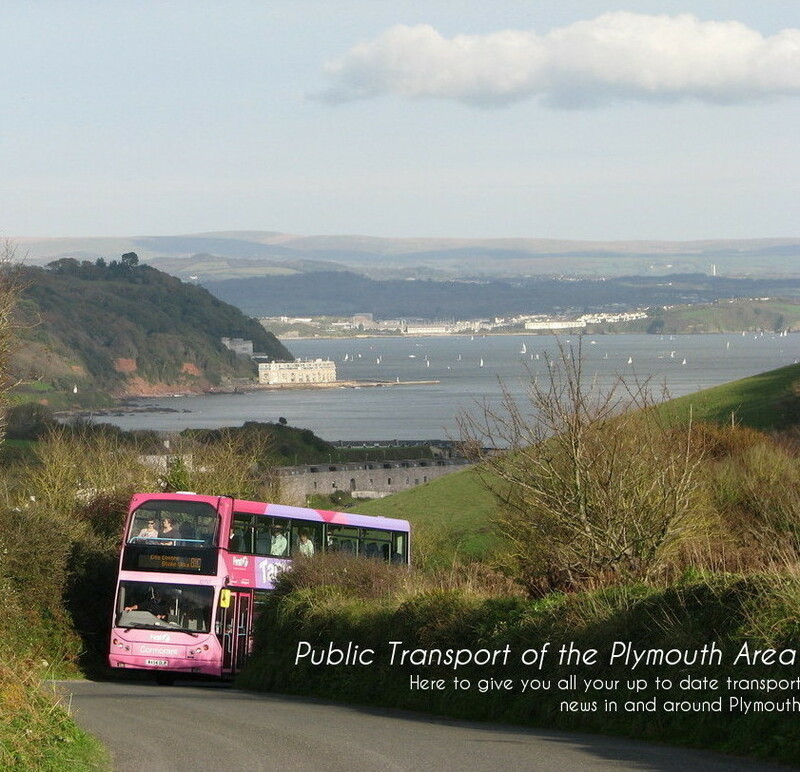 The 16:28 bus from Cremyll (the busiest of the day) has seen 2 buses operating it, one as far as Millbrook with the Vario, and the other continuing on to Cawsand with the Transit. This has meant that I have pretty much had the bus to myself for this journey, all other people using the bus as far as Millbrook. The extra bus was provided for the extra capacity as the Transit can only carry 16, with none standing. First have been diverting some of the 81Cs via Anderton, mainly using Volvo Olympians. It has been quite a revival of the old 81B operated by Western National, and FDC before the Tridents were introduced in 2005. One driver even put 81B on the blind, which I must say was a very nice gesture, well done! Still correct in its destination, saying Plymouth. 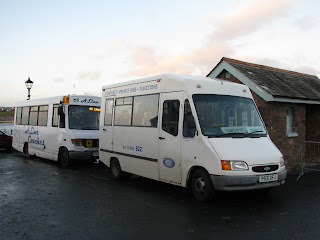 The three newly introduced K-ORLs have never had to negotiate Anderson, due to the withdrawal of the Anderton school bus, before they joined the depot. Only K802 ORL (currently out of action due to accident damage) has done the route, though she was here in the final days of the 81B. The drivers have all had a smile on their faces coming past on this route, I must say it is that bit more interesting and challenging than a blast over Maker! Torpoint has now gained a 3rd Dart, in the shape of 43810, a '52' reg Dart, previously in the Trevithick Link livery, based in Truro. I must say I do prefer the newer Mini Darts, they always seem that bit more powerful, this particular example absolutely flies compared to the 2 S-regs. Sadly though what you gain in speed you loose in comfort, these having the horrible 'urban 90' seating. It has been rumoured that these three will take over many of the Olympian duties, reducing Torpoint to just one Olympian. Video will be uploaded of her shortly.